It seems that some MacOS control panels that worked in the MacOS emulation environment of version 10.1 of NeXTStep (‘Mac OS X’) are disabled in 10.2. This is a shame, since there are at least some that are still extremely useful in NeXTStep. 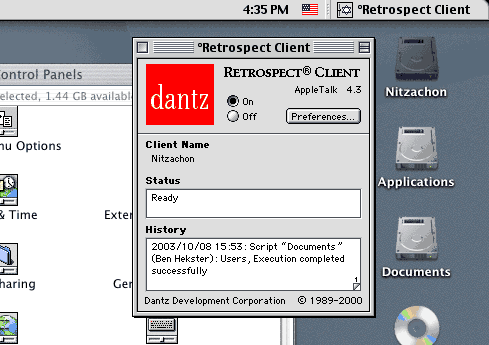 For instance, the Retrospect Backup Client still lets you back up NeXTStep clients over AppleTalk. Of course, the real solution to this problem would be to find out how NeXTStep decides which control panels to support. Until I do, this works.